Be your own boss behind the wheel of your big rig.Bid on jobs, then hit the road in one of six powerful trucks including monster 18 wheelers, flatbeds and tankers, to deliver faster than the competition. Bid on 16 cargo loads, weighing the hazards and payoffs of each delivery. Road hazards, low fuel and even the police can affect the timeliness and condition of your deliveries — and impact your bottom line. It’s all in a day’s work when you’re driving the big rigs. * Jump behind the wheel of 6 powerfultrucks including monster 18 wheelers, flatbeds and tankers.Bid on 16 cargo loads, weighing the hazards and payoffs of each delivery. * Log thousands of miles as you travel actual US highways across the Desert, through the Mountains and along the Coast in 11 states. * Manage your cargo—overloaded or carelessly handled goods can slow your delivery time and reduce your payout. UYARI: NoDVD Fixi kurmak için yapmanız gereken tek şey, indirdiğiniz rar içinde çıkan DLL dosyasını kopyalayıp, oyunu kurduğunuz yerdeki GAME klasörünün içindeki SYS klasörünün içine atmak. 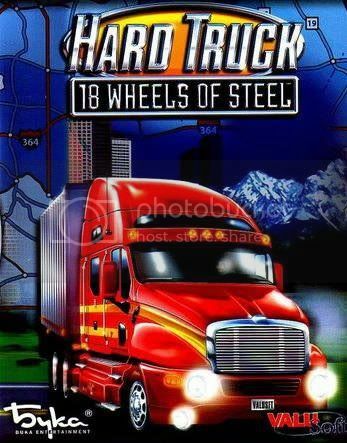 (Extract the included dll into your Hard Truck 18 Wheels of Steel Installation Folder: “…Hard Truck 18 Wheelsgamesys“. You can now play without a CD.